Ah, summer! It means summer camp, taking hikes and songs around the campfire! 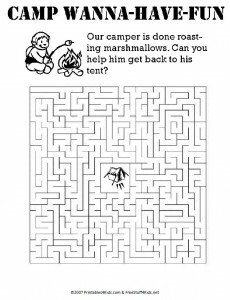 Get in the spirit of roasting marshmallows and telling ghost stories with our Campfire Maze activity. Click on the image to view and print the maze full size! Don’t forget to check out the rest of our summer printables perfect for camp, day care, preschools, trips to Grandma’s and just everyday fun!